Spanish hurdler Josephine Onyia received a two-year ban on October 7, 2009 after failing two post-race doping tests within 11 days. The Court of Arbitration for Sport said it had upheld appeals filed by the IAAF after the Spanish Athletics Federation refused to sanction Onyia. "Josephine Onyia is declared ineligible for a period of two years, commencing on September 22, 2009," the court said in a statement. "In both cases, the (Spanish federation) exonerated the athlete of any doping violation and the IAAF requested the CAS to impose a two-year suspension." The 23-year-old Onyia tested positive for the banned stimulant methylhexaneamine after racing at the Athletissima meet in Lausanne, Switzerland, on Sept. 2, 2008. She tested positive for the banned anabolic agent clenbuterol after winning the 100-meter hurdles at the World Athletics Final in Stuttgart, Germany, on Sept. 13 last year. 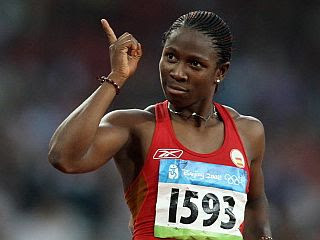 The court stripped the Nigerian-born Onyia of her results, prizes and appearance money gained since her race in Lausanne. The two failed tests were treated as a single doping violation because Onyia raced in Stuttgart before being notified of the Lausanne test findings, CAS said. The Spanish federation disputed the results and allowed Onyia to compete during the indoor season. She reportedly tested negative two days before and two days after her positive clenbuterol test. Clenbuterol is used as a weight-loss drug which builds muscle while burning fat. It is commonly given to horses to treat breathing problems. Onyia was born in Nigeria but obtained Spanish citizenship in 2007. She won the 100 hurdles at Golden League meetings in Oslo and Berlin last year.